Welcome to The Garden People! Celebrating 35 Years in Riverside Park! We welcome you to share in the beauty of New York City's 91st Street Community Garden, nestled in the middle level of Riverside Park, between West 90th and 91st Streets. 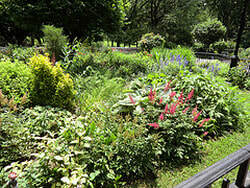 The gardens bloom from early spring until late autumn with an ever-changing variety of blossoms and color. 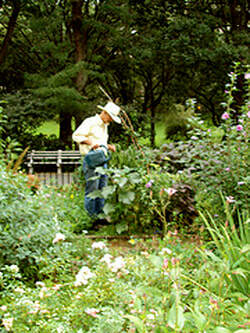 The flowers and plants are all maintained by our dedicated volunteer gardeners, known as The Garden People. If you missed this beautiful stretch of Riverside beside The Soldiers' and Sailors' Memorial and the Riverside midlevel bike path, you may have already caught a glimpse of us in a charming little love story. Our renown reached beyond the neighborhood when the gardens were used as a backdrop in the 1998 film "You've Got Mail." We were recently featured by Garden People favorite, NPR! Read the incredible story with beautiful photos by Darryl Pitt here. One of our many knowledgeable and patient gardeners tending through the afternoon sun. A view of the octagon, a community space planted and managed completely by volunteers.